A surgeon is a physician who has trained specifically to operate on patients in need of a variety of acute surgical procedures. Surgery involves making an incision on the patient's body and repairing or removing an internal part of the body and then closing the incision for optimum recovery. Some surgeons are specialized and fellowship-trained in a particular type of surgery, while other surgeons, called “general surgeons” are broader in scope but do not perform highly specialized types of surgery such as brain or heart surgeries. A surgeon, like other physicians, must first complete an undergraduate, or bachelor’s degree, before attending medical school to complete a doctorate of medicine (M.D.) or a doctorate of osteopathic medicine. (D.O.) Obtaining both the undergraduate and medical degrees is typically an eight-year process unless one participates in a combined undergraduate and medical school program which is usually about six or seven years instead of eight. After school, the future surgeon attends a surgical residency program which is typically 5 years. There are several different types of residencies including general surgery, orthopedic surgery (bones, joints, tendons), neurosurgery (brain, spinal cord) and more. If a surgeon would like to further subspecialize in a particular type of surgery, the surgeon could attend additional years of training, called fellowships, wherein he or she would learn additional techniques and procedures pertaining to a specific part of the body or learn highly complex surgical skills which more generalized surgeons do not provide. Surgeons typically work four and a half to five days a week on a regular basis, plus any time being on-call for emergencies or urgent situations. Like most physician jobs, being a surgeon is more than a forty-hour per week job. Most surgeons work 50-60 hours weekly, including on-call time, administrative duties, and other responsibilities. Usually, surgeons will have about 3 days blocked off for surgery and 2 days devoted to office hours for follow-up appointments or pre-operative consultations. The case load can vary, based on the type and complexity of surgeries performed, and can be anywhere from 150 per year up to 500 or more. The average is about 300-400 surgeries annually. In addition to time spent operating on patients, meeting with them, and consulting with other physicians, surgeons must also spend time on administrative matters such as dictating progress notes for patient records. Also, while some surgeons are employed by hospitals, most surgeons are owners or partial owners of their own practices, so they must assist in the management of business matters as well. Like most doctors, physicians should be knowledgeable in the field of math, science, biology, anatomy, and physiology. In addition, surgeons should have outstanding dexterity and eye-hand coordination. Surgeons must be comfortable working under intense pressure, performing high-risk procedures and handling life or death situations. Attention to detail is paramount for surgeons, as mistakes can be deadly in an operating room. Laparoscopic surgery, also known as minimally invasive surgery, is one of the most common types of surgical techniques now utilized by surgeons. Laparoscopy is a type of surgery which minimizes risk and scarring for the patient with smaller incisions and less trauma to the body. During laparoscopic surgery, a small surgical instrument with a tiny camera is inserted into the patient’s body. The camera projects magnified images onto a video screen so that the physician can maneuver the surgical instruments from outside the patient's body, eliminating the need for large open incisions, and the recovery time is much shorter. The use of robotic machines in surgery is a growing trend, which utilizes automated machines to increase precision for particularly sensitive areas or difficult maneuvers. The use of robotics is becoming increasingly popular particularly among larger healthcare systems which can afford to purchase the costly multi-million dollar robotic equipment. Surgeons spend about half or more of their work time in an operating room (OR), either at a hospital or outpatient surgery center. The non-surgical time is typically spent in an office setting, where surgeons will meet with the patient for the pre- and post-operative patient visits and consultations. These visits include the initial exam of the patient to assess the problem, then ordering any necessary scans or tests needed to confirm the issue and the best treatment plan. After surgery, the surgeon meets with the patient again to ensure that the surgery was successful, prescribe physical therapy as needed, and making sure the patient's recovery is on track. Following are a few examples of different types of surgeons, the number of years of training required after medical school, and the average annual compensation based on the most recent data available. General Surgeons: (5 Years of residency, no fellowship required) Perform appendectomies, hernia surgeries, and other types of surgeries including liver, spleen, intestinal, and some head, neck, chest surgeries, excluding hearts. General surgeons may decide to specialize in other types of surgeries by completing fellowship training in vascular surgery (operating on veins and arteries), thoracic surgery, cardiac surgery (heart surgery), hand surgery, pediatric surgery, and more. Average Compensation: $402,409, according to the MGMA Physician Compensation and Production Survey, 2013 edition based on 2012 compensation. Orthopedic surgeons: (5 Years of orthopedic surgery residency training) Orthopedic surgeons specialize in surgery of the joints, bones, tendons, and muscles. This includes arthroscopy, joint replacement or reconstruction, bone fusions, operating on broken or shattered bones, and more. For further specialization, orthopedic surgeons can choose fellowships in sports medicine, hand surgery, foot and ankle surgery, spine surgery, and others. Average compensation: $586,311 for general orthopedic surgeons in 2012, based on the 2013 MGMA Physician Compensation and Production Survey. Neurosurgeons: (5 Years of neurosurgery residency training) Neurosurgeons specialize in brain surgery and spinal cord surgery. 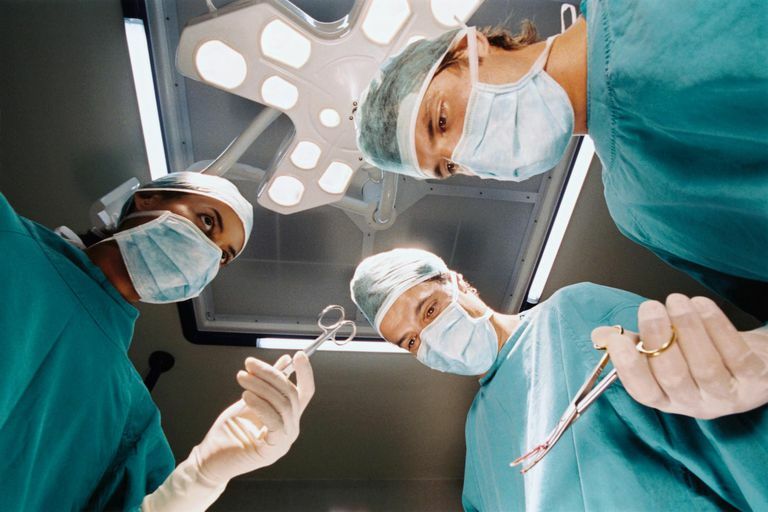 They are the highest paid of all surgeons, with incomes that can reach as high as $800,000-1,000,000 annually. Average annual compensation: $765,321 according to the 2013 MGMA survey of 2012 income.